For the 1986 Italian film, see Camorra (1986 film). The Camorra (Italian: [kaˈmɔrra]; Neapolitan: [kaˈmorrə]) is an Italian Mafia-type crime syndicate, or secret society, which arose in the region of Campania and its capital Naples. It is one of the oldest and largest criminal organizations in Italy, dating back to the 17th century. Unlike the pyramidal structure of the Sicilian Mafia, the Camorra's organizational structure is more horizontal than vertical. Consequently, individual Camorra clans act independently of each other, and are more prone to feuding among themselves. The origins of the Camorra are not entirely clear. It may date back to the 17th century as a direct Italian descendant of a Spanish secret society, the Garduña, founded in 1417. Officials of the Kingdom of Naples may have introduced the organization to the area, or it may have grown gradually out of small criminal gangs operating in Neapolitan society near the end of the 18th century. However, recent historical research in Spain suggests that the Garduña never really existed and was based on a fictional 19th century book. The first official use of the word dates from 1735, when a royal decree authorised the establishment of eight gambling houses in Naples. The word is likely a blend, or portmanteau, of "capo" (boss) and a Neapolitan street game, the "morra". (In this game, two persons wave their hands simultaneously, while a crowd of surrounding gamblers guess, in chorus, at the total number of fingers exposed by the principal players.) This activity was prohibited by the local government, and some people started making the players pay for being "protected" against the passing police. The Camorra first emerged during the chaotic power vacuum in the years between 1799 and 1815, when the Parthenopean Republic was proclaimed on the wave of the French Revolution and the Bourbon Restoration. The first official mention of the Camorra as an organization dates from 1820, when police records detail a disciplinary meeting of the Camorra, a tribunal known as the Gran Mamma. That year a first written statute, the frieno, was also discovered, indicating a stable organisational structure in the underworld. Another statute was discovered in 1842, including initiation rites and funds set aside for the families of those imprisoned. The organization was also known as the Bella Società Riformata, Società dell'Umirtà or Onorata Società. The evolution into more organized formations indicated a qualitative change: the Camorra and camorristi were no longer local gangs living off theft and extortion; they now had a fixed structure and some kind of hierarchy. Another qualitative leap was the agreement of the liberal opposition and the Camorra, following the defeat in the 1848 revolution. The liberals realized that they needed popular support to overthrow the king. They turned to the Camorra and paid them, the camorristi being the leaders of the city's poor. The new police chief, Liborio Romano, turned to the head of the Camorra, Salvatore De Crescenzo, to maintain order and appointed him as head of the municipal guard. The Camorra effectively had developed into power brokers in a few decades. In 1869, Ciccio Cappuccio was elected as the capintesta (head-in-chief) of the Camorra by the twelve district heads (capintriti), succeeding De Crescenzo after a short interregnum. Nicknamed 'The king of Naples' ('‘o rre 'e Napole) he died in 1892. The original low camorra held sway over the poor plebs in an age of abjection and servitude. Then there arose a high camorra comprising the most cunning and audacious members of the middle class. They fed off trade and public works contracts, political meetings and government bureaucracy. This high camorra strikes deals and does business with the low camorra, swapping promises for favours and favours for promises. The high camorra thinks of the state bureaucracy as being like a field it has to harvest and exploit. Its tools are cunning, nerve and violence. Its strength comes from the streets. And it is rightly considered to be more dangerous, because it has re-established the worst form of despotism by founding a regime based on bullying. The high camorra has replaced free will with impositions, it has nullified individuality and liberty, and it has defrauded the law and public trust. The Inquiry introduced the terminology of "high Camorra", with a bourgeois character, but distinct from the plebeian Camorra proper, although both were in close contact through the figure of the intermediary (faccendiere). From the rich industrialist who wants a clear road into politics or administration to the small shopowner who wants to ask for a reduction of taxes; from the businessman trying to win a contract to a worker looking for a job in a factory; from a professional who wants more clients or greater recognition to somebody looking for an office job; from somebody from the provinces who has come to Naples to buy some goods to somebody who wants to emigrate to America; they all find somebody stepping into their path, and nearly all made use of them. However, whether the "high Camorra" was an integral part of the Camorra proper is disputed. Although the inquiry did not prove specific collusion between the Camorra and politics, it brought to light the patronage mechanisms that fueled corruption in the municipality. The society's influence was weakened which was exemplified by the defeat of all of their candidates in the 1901 Naples election. Many camorristi left for the United States in the early 20th century. The Cuocolo trial in Viterbo. Most of the defendants are in the large cage. The three in front are (from left to right) the priest Ciro Vitozzi, Maria Stendardo, the only female defendant, and Enrico Alfano. In the small cage to the right is the crown witness Gennaro Abbatemaggio. 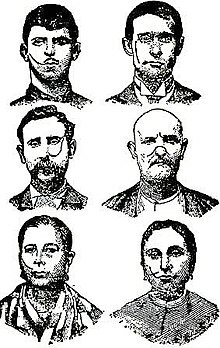 The Camorra received another blow with the Cuocolo trial (1911–1912). While the trial was about the murder of the Camorrista Gennaro Cuocolo and his wife, suspected of being police spies, on June 6, 1906, the main investigator, Carabinieri Captain Carlo Fabbroni, transformed it from a murder trial into one against the Camorra as a whole. Fabbroni intended to use the trial to strike the final blow to the Camorra. The trial attracted a lot of attention of newspapers and the general public both in Italy as well as in the United States, including by Pathé's Gazette. The hearings began in the spring of 1911 and would continue for twelve months. After a 17-month trial, the often tumultuous proceedings ended with a guilty verdict on July 8, 1912. The defendants, including 27 leading Camorra bosses, were sentenced to a total of 354 years' imprisonment. The main defendant and nominal head of the Camorra, Enrico Alfano, was sentenced to 30 years. The Camorra was never a coherent whole nor a centralised organization. Instead, it has always been a loose confederation of different, independent groups or families. Each group was bound around kinship ties and controlled economic activities which took place in its particular territory. Each family clan took care of its own business, protected its territory, and sometimes tried to expand at another group's expense. Although not centralized, there was some minimal coordination, to avoid mutual interference. The families competed to maintain a system of checks and balances between equal powers. Compared to the Sicilian Mafia's pyramidal structure, the Camorra has more of a 'horizontal' than a 'vertical' structure. As a result, individual Camorra clans act independently of each other, and are more prone to feuding among themselves. This however makes the Camorra more resilient when top leaders are arrested or killed, with new clans and organizations germinating out of the stumps of old ones. As the Galasso clan boss Pasquale Galasso once stated in court; "Campania can get worse because you could cut into a Camorra group, but another ten could emerge from it." In 2004 and 2005 the Di Lauro clan and the so-called Scissionisti di Secondigliano fought a bloody feud which came to be known in the Italian press as the Scampia feud. The result was over 100 street killings. At the end of October 2006 a new series of murders took place in Naples between 20 competing clans, that cost 12 lives in 10 days. The Interior Minister Giuliano Amato decided to send more than 1,000 extra police and carabinieri to Naples to fight crime and protect tourists. Despite this, in the following year there were over 120 murders. In 2001 the businessman Domenico Noviello from Caserta testified against a Camorra extortionist and subsequently received police protection. In 2008 he refused further protection and was killed one week later. In recent years, various Camorra clans have been allegedly utilizing alliances with Nigerian drug gangs and the Albanian mafia. Augusto La Torre, the former La Torre clan boss who became a pentito, is married to an Albanian woman. It should also be noted that the first foreign pentito, a Tunisian, admitted to being involved with the feared Casalesi clan of Casal di Principe. The first town in which the Camorra sanctioned stewardship by a foreign clan was Castel Volturno, which was given to the Rapaces, clans from Lagos and Benin City in Nigeria. This allowed them to traffic cocaine and women in sexual slavery before sending them across the whole of Europe. The situation worsened during this period as the camorra diversified their illegal waste disposal strategy: 1) transporting and dumping hazardous waste in the countryside by truck; 2) dumping waste in illegal caves or holes; 3) mixing toxic waste with textiles to avoid explosions and then burning it; and 4) mixing toxic with urban waste for disposal in landfills and incinerators. With the assistance of private businessmen known as "stakeholders", the numerous Camorra clans are able to gain massive profits from under-the-table contracts with local, legitimate businesses. These "stakeholders" are able to offer companies highly lucrative deals to remove their waste at a significantly lower price. With little to no overhead, Camorra clans and their associates see very high profit margins. According to author Roberto Saviano, the Camorra uses child labour to drive the waste in for a small price, as they do not complain about the health risks as the older truckers might. In November 2013 a demonstration by tens of thousands of people was held in Naples in protest against the pollution caused by the Camorra's control of refuse disposal. Over a twenty-year period, it was alleged, about ten million tonnes of industrial waste had been illegally dumped, with cancers caused by pollution increasing by 40–47%. The Camorra has proven to be an extremely difficult organization to fight within Italy. At the first mass trial against the Camorra in 1911–12, Captain Carlo Fabroni of the Carabinieri gave testimony on how complicated it was to successfully prosecute the Camorra: "The Camorrist has no political ideals. He exploits the elections and the elected for gain. The leaders distribute bands throughout the town, and they have recoursed to violence to obtain the vote of the electors for the candidates whom they have determined to support. Those who refuse to vote as instructed are beaten, slashed with knives, or kidnapped. All this is done with assurance of impunity, as the Camorrists will have the protection of successful politicians, who realize that they cannot be chosen to office without paying toll to the Camorra." Unlike the Sicilian Mafia, which has a clear hierarchy and a division of interests, the Camorra's activities are much less centralized. This makes the organization much more difficult to combat through crude repression. In Campania, where unemployment is high and opportunities are limited, the Camorra has become an integral part of the fabric of society. It offers a sense of community and provides the youth with jobs. Members are guided in the pursuit of criminal activities, including cigarette smuggling, drug trafficking, and theft. The government has made an effort to combat the Camorra's criminal activities in Campania. The solution ultimately lies in Italy's ability to offer values, education and work opportunities to the next generation. However, the government has been hard pressed to find funds for promoting long term reforms that are needed to improve the local economic outlook and create jobs. Instead, it has had to rely on limited law enforcement activity in an environment which has a long history of criminal tolerance and acceptance, and is governed by a code of silence or omertà that persists to this day. Michele Zagaria, a senior member of the Casalesi clan, was arrested in 2011 after eluding police for 16 years. He was found in a secret bunker in the town Casapesenna, near Naples. In 2014, clan boss Mario Riccio was arrested for drug trafficking in the Naples area. Around the same time 29 suspected Camorra members were also arrested in Rome. In 2008, Italian police arrested three members of the Camorra crime syndicate on September 30, 2008. According to Gianfrancesco Siazzu, commander of the Carabinieri police, the three were captured in small villas on the coast of Naples. All three had been on Italy's 100 top most wanted list. Police seized assets valued at over 100 million euros and also weapons, including two AK-47 assault rifles that may have been used in the shooting of six Africans on September 18, 2008. Police found pistols, Carabinieri uniforms and other outfits that were used to disguise members of the operation. During the same week, a separate operation netted 26 additional suspects in Caserta. All were believed to belong to the powerful Camorra crime syndicate that operates in and around Naples. The suspects were charged with extortion and weapons possession. In some cases, the charges also included murder and robbery. Giuseppina Nappa, the 48-year-old wife of a jailed crime boss, was among those arrested. She is believed to be the Camorra's local paymaster. In November 2018, Italian police announced the arrest of Antonio Orlando, suspected of being a major figure in the Camorra. In March 2019, Marco Di Lauro, the second most wanted man in Italy, was arrested after spending 14 years on the run. He is the fourth son of ex-Camorra boss Paolo Di Lauro. In 2010, an informant said that he was responsible for at least four murders. Despite its origins, it presently has secondary ramifications in other Italian regions, like Lombardy, Piedmont and Emilia-Romagna, in connection with the centers of national economic power. It has also spread outside the Italy's boundaries, and acquired a foothold in Spain, Netherlands, France, Belgium, Greece, United Kingdom, Romania, Luxembourg, Switzerland, Morocco, United States, Peru, Dominican Republic, Argentina and Colombia. According to Roberto Saviano, Camorra clans sold arms to the Government of Argentina during the Falklands War. And according the Italian magistrates the Camorra clans have large amounts of money in banks and investiments hidden in the country. In 1997, Mario Fabbrocino, leader of one of the most powerful Camorra clans, was arrest in San Martín, Buenos Aires. According to the police he would be controlling his international drug trafficking business in the country. Fabbrocino was extradited to Italy and is serving a life sentence in the 41-bis regime. Although the 'Ndrangheta is considered the most prominent mafia in Belgium, Camorra is also very active in the country. The port of Antwerp is one of the main gateways to drugs enter in Europe from South America. The Camorra clans in Belgium deal in international drug trafficking, money laundering, and reinvesting in real-states. The Secondigliano Alliance, a powerful alliance between the Contini clan, the Licciardi clan and the Mallardo clan is active in Brussels. In 2010, Vittorio Pirozzi, of the Mariano clan, was arrested in his apartment in Brussels. Pirozzi led a bloody war over the control of the Quartieri Spagnoli in the center of Naples in the mid-1980s. According to the media, he is a international drug trafficker, was among the 100 most wanted criminals in Italy and sentenced to 15 years in prison. In the 1970s, Antonio Bardellino, Casalesi clan boss, moved from Aversa with his family to Santo Domingo, Dominican Republic. From Santo Domingo, Bardellino controlled a fish flour import-export enterprise, while building a massive cocaine trade from the Caribbean to the countryside of Aversa, passing through Alberto Beneduce, one of the leaders of the clan and friend of Michele Zagaria. In 2009, Ciro Mazzarella, one of the leaders of the Mazzarella clan, was arrested in Santo Domingo. In the country, he lived in a luxurious residence and held the reins of the clan especially for the management of drug trafficking. The Camorra has been present in France since the early 1980's. The locations with the biggest presence of the organization in the country is the French Riviera, Paris and Lyon. And their biggest objective in the country has always been to create contacts for drug trafficking but also money laundering. In 1993, the Camorra and the Sicilian Mafia were accused the of running a $1.5 billion operation to launder drug money through banks, insurance companies, hotels and casinos in Italy and on the French Riviera, arresting 36 suspects. Paolo Di Lauro funnelled the proceeds into real estate, buying dozens of flats in Naples, owning shops in France and the Netherlands, as well as businesses importing fur, fake fur and lingerie. In 2014, Antonio Lo Russo, member of the powerful Lo Russo clan and considered the new regent of the clan, and his cousin Carlo Lo Russo were arrested by agents of National Gendarmerie Section de recherches and by Carabinieri when quietly in a bar in Nice. The clan is accused of extortion, drug trafficking and murder. According to the then Minister of the Interior of France, Bernard Cazeneuve, the arrest of Lo Russo was a hard blow for the organized crime in the country. In Greece, the Camorra clans are most active in Illicit cigarette trade and drug trafficking. Acccording to the pentito Gaetano Guida, the Di Lauro clan has invested a lot of money in Greece. The Sacco-Bocchetti clan is among the clans who uses Greece as a important route to supply heroin in Europe. In 2017, three people belonging to the Mariano clan were arrested, they were accused of infiltration into the fish market of Naples, buying fish often from Greece, to launder money. The Italian state confiscated €30 million including real estates in Luxembourg belonging to Angelo Grillo, a businessman from Marcianise, considered very close to the Belforte clan. Grillo also owned the company Lynch Invest SA based in the country. In the name of this company, he purchased real estates in Campania and Sardinia. Giuseppe Polverino, the leader of the Polverino clan before his arrest, was considered the 'hashish king', due to his monopoly on the importation of hashish from Morocco to Italy via Spain supplying not only all the Camorra clans, but also the 'Ndrangheta, the Sicilian Mafia and the Sacra Corona Unita. The Polverino clan had a monopoly of the hashish trade since 1992. According to one of the pentitos of the clan, Domenico Verde, the hashish was cultivated in the region of Ketama, and arrived by mules in the beginning, but later was modernized and accessible on trucks and cars. On March 18, 2019 an Italian, suspected of being one of the leaders of the Mazzarella clan, was arrested in the Ourika region, near Marrakech. He had a pursuant to a red notice issued against him by Interpol in January 2019. According to Francesco Forgione, the former president of the Antimafia Commission, the Camorra is very active in gambling houses and money laundering in the Netherlands. The Camorra also uses the country to counterfeit clothes, and the clans most involved in this illegal activity are the Licciardi clan, the Di Lauro clan and the Sarno clan. Augusto La Torre, the former leader of the La Torre clan is suspected of having hid hundreds of millions of euros in Dutch banks, as the La Torre clan was very active in the country in the 1990s transporting large cocaine shipments from South America to Naples via the Netherlands. In 1996, Raffaele Imperiale bought a coffee shop called Rockland coffee in Amsterdam, where he sold soft drugs. And was involved in large scale cocaine trafficking with the Dutch drug trader Rick van de Bunt; Imperiale worked in Amsterdam until 2008. In 2016, two stolen Van Gogh paintings from the Van Gogh Museum in Amsterdam in 2002, were recovered in a villa near Naples, connected to Raffaele Imperiale, accused of being one of the Camorra's prolific drug barons. Imperiale was sentenced to 18 years in absentia for drug offenses. After fleeing the Netherlands to Dubai, he had been seen in the Burj Al Arab hotel. In the 1980s, Umberto Ammaturo, a Camorra boss, established a virtual monopoly of cocaine trafficking to Italy from Peru, where he benefited from the protection and collusion of important personalities. According to the DEA, due to his trafficking activities, Ammaturo was one of the chief financiers of the Shining Path guerrilla movement in Peru. The Camorra boss and member of the Mazzarella clan, Saltavore Zazo, was allegedly involved in a large scheme of international cocaine trafficking from Peru to Europe, with the intention to acquire total control of the Port of Callao; one of his contacts was drug lord Gerald Oropeza, one of the biggest traffickers in Peru. According to the DEA, Zazo would manage more than U$500 million per year in shipments of cocaine through the ports of the country to Europe. Camorra clans in Romania deal in money laundering. In 2017, Gaetano Manzo, the accountant of the Sacco-Bocchetti clan, was arrested in his villa in Fizeșu Gherlii. The Sacco-Bocchetti clan is a subgroup of the Licciardi clan and Manzo took care of the accounting of the clan, and often supervised the supply of drugs from abroad. In 2018, Nicola Inquieto, an Italian businessman with strong ties to Michele Zagaria one of the leaders of the powerful Casalesi clan, was arrested in Romania. Inquieto has built hundreds of apartments through his companies and owns the most modern spa in Argeș County. The prosecutors have also seized 400 apartments in Pitești belonging to his companies. His businesses in the country are valued at several million euros. According to the journalist Roberto Saviano, Spain (after Italy) is the European country most entwined with the Camorra. It is where the Camorra clans established its massive businesses revolving around drug trafficking and money laundering in real estate. Camorra has been in Spain since the 1980s. The most powerful clan acting in the country is the Polverino clan due to the number of people they have installed and because of the potential of their structure. They have influence in the cities of Alicante, Tarragona, Málaga and Cádiz. According to the Italian antimafia police, in recent times, the Camorra clans based in Spain have accumulated €700 million as a result of drug trafficking and money laundering in the country. The presence of the organization in the Costa del Sol is so strong that Camorra bosses refer to it as Costa Nostra' ("Our Coast"), according to Italian journalist Roberto Saviano, a specialist on the Naples criminal underworld. Another clan with influence in Spain is the Scissionisti di Secondigliano led by Raffaele Amato nicknamed Lo Spagnolo (the Spaniard), because before creating his own clan, he controlled the drug trafficking operation from Galicia to Naples for the Di Lauro clan. Amato was arrested as he left a casino in Barcelona in 2005. In February 2019, the Spanish police arrested 14 members of the notorious Marranella clan. According to the Guardia Civil, the clan is one of the most important and violent criminal organizations dedicated to the international drug trade and is based in the Costa del Sol. The Camorra has had a presence in Switzerland for more than 50 years, undertaking money laundering but also arms trafficking and drug trafficking. The Casalesi clan is present throughout the country, and according to the investigations into the clan, it has numerous Swiss bank accounts. In 1992, Ciro Mazzarella, boss of the Mazzarella clan, decided to move to Switzerland, after losing a war between Camorra clans in Naples. From his logistics base in Lugano, he created an enviable economic empire with cigarette smuggling that arrives from Montenegro. In 2017, assets worth €20 million belonging to the Potenza brothers, who are considered to be linked to the Lo Russo clan, were seized in Lugano, including bank accounts in BSI. Scotland has had its brush with the Camorra. Antonio La Torre of Aberdeen was the local "Don" of the Camorra. He is the brother of Camorra boss Augusto La Torre of the La Torre clan which had its base in Mondragone, Caserta. The La Torre Clan's empire was worth hundreds of millions of euros. Antonio had several legitimate businesses in Aberdeen, whereas his brother Augusto had several illegal businesses there. Augusto would eventually become a pentito in January 2003. Antonio was convicted in Scotland and extradited to Italy in 2006 to serve a 13-year sentence; he was released in 2014. Two Aberdeen restaurateurs, Ciro Schiattarella and Michele Siciliano, were extradited to Italy for their part in the "Aberdeen Camorra". A fourth Scottish associate made history by becoming the first foreign member of the Camorra and is currently serving a jail sentence in the UK. It has been reported that he also receives a monthly salary, legal assistance and protection. Saviano alleges that from the 1980s, Italian gangsters ran a network of lucrative businesses in the city as well as many illegal rackets. Saviano said Scotland's third city, with no history of organized crime, was seen as an attractive safe haven away from the violent inter-gang bloodletting that had engulfed their Neapolitan stronghold of Mondragone. Saviano claims that before the Italian clans arrived, Aberdeen did not know how to exploit its resources for recreation and tourism. He further states that the Italians infused the city with economic energy, revitalised the tourist industry, inspired new import-export activities and injected new vigour in the real-estate sector. It thereby turned Aberdeen into a chic, elegant address for fine dining and important dealings. However, the suggestion that the city remains in the grip of mobsters has been strongly denied by leaders of the 300 strong Italian community in Aberdeen. Moreover, Giuseppe Baldini, the Italian government's vice-consul in Aberdeen, denies that the Camorra still maintains its presence in Aberdeen. The Camorra existed in the United States between the mid-19th century and early 20th century. They rivaled the defunct Morello crime family for power in New York City. Eventually, they melded with the early Italian-American Mafia groups. Many Camorra members and associates fled the internecine gang warfare and Italian Justice and immigrated to the United States in the 1980s. In 1993, the FBI estimated that there were 200 camorristi in the United States. Although there appears to be no clan structure in the United States, Camorra members have established a presence in Los Angeles, New York City and Springfield, Massachusetts. The Camorra is the least active of all the organized crime groups in the United States. In spite of this, the US law enforcement considers the Camorra to be a rising criminal enterprise, especially dangerous because of its ability to adapt to new trends and forge new alliances with other criminal organizations. In the 1970s, the Sicilian Mafia convinced the Camorra to convert their cigarette smuggling routes into drug smuggling routes with the Sicilian Mafia's assistance. Not all Camorra leaders agreed, leading to the Camorra Wars that cost 400 lives. Opponents of drug trafficking lost the war. The Camorra made a fortune in reconstruction after an earthquake ravaged the Campania region in 1980. Now it specializes in cigarette smuggling and receives payoffs from other criminal groups for any cigarette traffic through Italy. The Camorra is also involved in money laundering, extortion, alien smuggling, robbery, blackmail, kidnapping, political corruption, and counterfeiting. It is believed that nearly 200 Camorra affiliates reside in this country, many of whom arrived during the Camorra Wars. In 2012, the Obama administration imposed sanctions on the Camorra as one of four key transnational organized crime groups, along with the Brothers' Circle from Russia, the Yamaguchi-gumi (Yakuza) from Japan, and Los Zetas from Mexico. According to the media, there has always been alliances between the Camorra and the 'Ndrangheta members. On August 26, 1976, Domenico Tripodo, a powerful 'Ndrangheta boss of the time, was stabbed to death in prison on the request of the De Stefano 'ndrina with the help of Camorra boss Raffaele Cutolo, the boss of the Nuova Camorra Organizzata (NCO) who worked with the De Stefano's in drug trafficking. The Tamanaco operation that ended on June 22, 2010, destroyed a drug trafficking operation managed by the La Torre clan from Mondragone and the Barbaro 'ndrina from Platì. The operation consisted in transporting the drugs from Venezuela and Colombia, through several European ports including the port of Amsterdam. At the port of Livorno, 700 kilos of cocaine were seized. On May 11, 2016, a criminal alliance between the sinti criminal organization Casamonica clan, members of the Camorra, and affiliates from the 'Ndrangheta's of Polistena, Taurianova and Melicucco was dismantled by the police. €25 million were seized. On March 21, 2018, 19 arrests were made in Rome of alleged members belonging to the Licciardi clan of the Camorra and members of the Filippone 'ndrina and Gallico 'ndrina accused of drug trafficking. Several Camorra clans have lasting relationships with the Cosa Nostra. Prominent elements of the Mafia such as Salvatore Riina, Leoluca Bagarella, Luciano Leggio and Bernardo Provenzano found themselves in contact with Camorra clans such as the Nuvoletta clan, members of the Camorra such as Michele Zaza and Antonio Bardellino, and with other groups that formed the Nuova Famiglia confederation in the 1980s. In 1981, Raffaele Cutolo, entrusted Pino Iannelli and Alessandro Fusco the task of founding a organization in Apulia to be directly controlled by the Nuova Camorra Organizzata, the organization was named Nuova Camorra Pugliese, later called Sacra Corona Unita. This organization operated in various cities of Apulia during the 1980s. But with the downfall of Cutolo, the organisation was no longer a subgroup of the Camorra and was under the leadership of Giuseppe Rogoli. According to the pentito Antonio Accurso, the Di Lauro clan has several links to the Sacra Corona Unita in question with regards to drug trafficking. The relationship between the South American drug cartels and the Italian criminal organizations for over 50 years. According to investigations, the Camorra member Tommaso Iacomino allegedly negotiated with the head of Peruvian and Colombian drug cartels over the cocaine trade. Giuseppe Gallo called 'o pazz (the crazy one), boss of the Limelli-Vangone clan, is said to having contacts with Colombian drug traffickers able to reach agreements for the purchase of large quantities of cocaine, supplying various clans in the Naples area. In 2016, Salvatore Iavarone, a broker in South America representing the Tamarisco clan from Torre Annunziata, was arrested in Ecuador. Iavarone is believed to be the main link for the shipment of narcotics from Ecuador to Europe. Other 28 members were arrested during this operation. The police also confiscated €11 million that belonged to Iavarone in Ecuador. According to the Direzione Investigativa Antimafia, the Albanian mafia has alliances with the Mazzarella clan and with the Scissionisti di Secondigliano, both from Naples and with the Serino clan, from Salerno. Roberto Saviano, an expert on the Camorra, spoke of the Albanian mafia as a "no longer foreign mafia" to Italy and stressed that the Albanians and Italians have a "brotherly" relationship with each other. Saviano notes that the Camorra feels great affinity with the Albanian crime families because both organizations are based on family ties. Some Camorra clans, including the Giuliano clan, once led by Luigi Giuliano, have established business relationships with chinese criminal gangs, especially in the sector of counterfeiting Italian brands. The Camorra clans imposed the final price of the products and in return they provided the services to get around the controls. In 2017, investigators discovered a scheme between the Camorra and the Chinese gangs. They exported industrial waste from Italy to China that guaranteed million-dollar revenues for both organizations. The industrial waste left Prato in Italy and arrived in Hong Kong. Among the Camorra clans involved in this alliance were the Casalesi clan, the Fabbrocino clan and the Ascione clan. In the beginning, the Nigerians were not tolerated by the Camorra but in recent times both organizations are making alliances. The relations between the Camorra and Nigerian mafia concern mainly drug trafficking and prostitution. In particular, Camorra members allowed the Nigeria gangs to organize the trafficking of women in the territory in exchange for a share on the earnings. The Nigerian mafia produces synthetic drugs independently and sells it with the consent of the Camorra. This alliance, however, can change from one moment to another, as the Nigerians have asked to be treated on par with other Italian mafias, for the fact that they are growing both as a military and as an economic force. In 1995, the Camorra cooperated with the Russian Mafia in a scheme in which the Camorra would bleach out US$1 bills and reprint them as $100s. These bills would then be transported to the Russian Mafia for distribution in 29 post-Eastern Bloc countries and former Soviet republics. In return, the Russian Mafia paid the Camorra with property (including a Russian bank) and firearms, smuggled into Eastern Europe and Italy. I dont know any cases, which are so big and where so many weapons have been sold. The new owners are also not "juvenile guarantors" but several members of the Camorra, one of the most dangerous criminal organizations in Europe. The weapons are believed to have come originally from Eastern Europe taken to Carinthia in Austria with the objective to arrive in Terzigno near Naples. With most of the old Camorra clans decapitated, and their bosses either dead or arrested, the organization is experiencing a rise in youth criminal gangs trying to take their places. This phenomenon is called Paranza, which is Camorra terminology, for a criminal group led by youngsters or "small fish". In the past, the older bosses often operated out of the limelight, but the young criminals in modern times broadcast their exploits on social media, posing in designer clothes, and €200 bottles of champagne. In 2014, Emanuele Sibillo was 18 and considered one of the first young and leading bosses of this new generation. In 2015, he was shot dead by a rival baby gang. Most of this young criminals are children of Camorra members that are currently in jail. We can clearly see the baby gangs are criminals, or people who want to have criminal careers. But there's a vacuum, because the traditional families have lost their leaders. In the centre of Naples the bosses are either in prison or they've become state witnesses, so there's this kind of space for younger kids to appear. They're 17 or 18 with criminal ambition, and they've got a sense of identity of what they want to do. However, according to Peppe Misso, called ’o nasone, former boss of the Misso clan for over 40 years and now pentito, this young generation of criminals are managed by the "real" Camorra clans, shifting the public attention to these baby gangs while they do their business in silence. According to Misso, the real power of the organization is now in the hands of the Licciardi clan, Mallardo clan, Moccia clan and Contini clan. On 2 September 2018, Ciro Mazzarella, one of the last historical godfathers of the Camorra, and head of the Mazzarella clan, died in his villa in the affluent neighbourhood of Posillipo, Naples at the age of 78. "Commendatori", an episode of The Sopranos which features the Camorra. Roberto Saviano's 2006 book Gomorra investigates the activities of the Camorra in Italy, especially in the Provinces of Naples and Caserta. Matteo Garrone adopted the book into a 2008 film, Gomorra, describing low level Camorra foot-soldiers, and in 2014 into a TV series of the same name. The 2009 film Fortapàsc (English: Fort Apache Napoli) directed by Marco Risi about the brief life and death of journalist Giancarlo Siani, murdered by camorrisiti from the Nuvoletta clan. The opera I gioielli della Madonna by Ermanno Wolf-Ferrari features the Camorra as part of the plot. The Camorra (depicted as a hooded secret society) appear as villains in an episode of The Wild Wild West, "The Night of the Dancing Death." In the Japanese light novel series and anime Baccano!, a handful of the main characters are part of the Camorra group known as the Martillo Family, and become quite insulted if they are mistaken for the Mafia. Elena Ferrante's four Neapolitan Novels are concerned with the damage done by the Camorra portrayed as the two Solara brothers. In Rei Hiroe's manga Black Lagoon, during the "El baile De La Muerte"/"Roberta's Blood Trail" arc, a man called Tomazo makes his appearance. Tomazo is on the side of the Italian mob leader Ronnie the jaws. Later it is revealed that Tomazo is a member of the Camorra, and his surname Falcone as well. In John Wick: Chapter 2, main antagonist Santino D'Antonio is a member of the Camorra. In the short story "The Fate of Faustina" by E. W. Hornung, it is revealed that the main character and criminal-in-hiding A. J. Raffles has made an enemy of a high-level member of the Camorra from his time spent in Italy. In the sequel story, "The Last Laugh", the Camorra try to realize that threat and kill Raffles; however, Raffles not only saves himself from his attackers but also tricks them into poisoning themselves. ^ "FBI Italian/Mafia". FBI. Archived from the original on May 24, 2014. Retrieved December 26, 2014. ^ "Camorra – Italian secret society". Encyclopædia Britannica. ^ Behan, Tom (1996). The Camorra. Routledge. p. 191. ISBN 9780415099875. ^ "Man who took on the Mafia: The truth about Italy's gangsters". The Independent. October 16, 2006. ^ Paul Kreiner (November 6, 2006). "Mit mehr Polizei gegen die Camorra". Der Tagesspiegel (in German). Retrieved May 24, 2018. ^ Hammer, Joshua (July 6, 2015). "Why Does the Mob Want to Erase This Writer?". GQ. ^ "Roberto Saviano on the Italian Camorra". Cafe Babel. October 8, 2007. Archived from the original on October 1, 2009. ^ D'Alisa, Giacomo; Burgalassi, David; Healy, Hali; Walter, Mariana (2010). "Conflict in Campania: Waste emergency or crisis of democracy". Ecological Economics. 70 (2): 239–249. ^ Loewe, Peter (April 7, 2007). "Här tvättar maffian sina knarkpengar". Dagens Nyheter (in Swedish). Stockholm: Bonnier AB. Archived from the original on October 1, 2007. Retrieved August 15, 2008. ^ "Naples rally against mafia's toxic waste dumping". BBC. November 17, 2013. Retrieved August 5, 2014. ^ "Says Politicians Hire The Camorra; Capt. Fabroni Declares Nobody Can Be Elected in Naples Without Its Aid" (pdf). The New York Times. July 13, 1911. Retrieved May 24, 2018. ^ "CAMORRA: processo Cuocolo". Museo criminologico. Archived from the original on January 2, 2018. Retrieved May 24, 2018. ^ a b c Owen, Richard (November 1, 2006). "Analysis: Naples, a city in the grip of the Camorra". The Times. Archived from the original on September 7, 2008. ^ "Sub-committee onpo East-West Economic Co-operation and Convergence and Sub-committee on Civilian Security and Co-operation Trip Report: Visit to Rome / Palermo Secretariat Report 6–8 May 1998 (Prefect Gennaro Monaco, Deputy-Chief of Police and Chief of the Section of Criminal Police)". NATO Parliamentary Assembly. August 18, 1998. Retrieved January 24, 2009. ^ "Mafia 'big man' arrested". BBC News. July 11, 1998. Retrieved May 24, 2018. ^ Pisa, Nick (December 8, 2011). "Camorra boss Michele Zagaria caught after police break into underground bunker". The Daily Telegraph. Retrieved May 24, 2018. ^ "Italy Camorra mafia clan boss Mario Riccio arrested". BBC News. February 4, 2014. Retrieved May 24, 2018. ^ Alessandra Rizzo (September 30, 2008). "Italy arrests scores of suspected mobsters". Salon. Retrieved October 4, 2008. ^ "Italian police arrest mafia boss at luxury hideout". The Guardian. November 27, 2018. Retrieved November 27, 2018. ^ Fedschun, Travis (March 3, 2019). "Mafia 'super fugitive' arrested in Italy after 14 years on the run". Fox News Channel. ^ "Comorra: 60 arresti tra Campania e Lombardia, anche 16 Giudici Tributari". Il Sole 24 Ore (in Italian). March 19, 2012. Archived from the original on August 2, 2016. ^ "Camorra: sequestrato a Milano il Gran Caffe' Sforza". Ansa (in Italian). July 4, 2012. Retrieved May 24, 2018. ^ Trocchia, Nello (July 4, 2012). "Camorra, sequestrati beni per 20 milioni. Anche un bar in centro a Milano". Il Fatto Quotidiano (in Italian). Retrieved May 24, 2018. ^ "MAFIE AL NORD/ 'Ndrangheta, camorra e mafia: ecco come le piovre conquistano il Paese" (in Italian). Infiltrato.it. January 19, 2011. Retrieved August 5, 2014. ^ "Camorra, sotto sequestro un ristorante di Torino: tra i proprietari Cannavaro" (in Italian). Torinotoday.it. June 30, 2011. Retrieved August 5, 2014. ^ "L'ombra della Camorra in Emilia Truffa e riciclaggio: 11 indagati". Il Resto del Carlino (in Italian). March 8, 2012. Retrieved May 24, 2018. ^ "'Renato' è il nuovo boss della camorra in Emilia" (in Italian). Radio Città del Capo. October 22, 2011. Retrieved August 5, 2014. ^ a b "Mafia and Organized Crime in Europe". Il Fatto Quotidiano. ^ Bargent, James (May 16, 2013). "Why Has the Italian Mafia Returned to Colombia?". ^ "Retrato de la camorra: la mafia globalizada". lanacion.com.ar. April 6, 2008. ^ Clarín.com. "Saviano: "Hay capitales de la mafia invertidos en Argentina"". clarin.com. ^ Clarín.com. "Cayó un capo de la camorra". clarin.com. ^ "Omicidio del figlio di Cutolo: ergastolo per il superboss Mario Fabbrocino". February 2, 2018. ^ a b "Belgium". Il Fatto Quotidiano. ^ "Arrestation d'un boss de la mafia napolitaine à Bruxelles". RTBF Info. August 5, 2010. ^ "Napoli, cinque morti ammazzati in pochi giorni, ma la camorra, è stata sconfitta dallo Stato, oppure è sempre padrona? :: deliapress.it Bova Marina RC". deliapolis.it. ^ "Preso a Santo Domingo Ciro Mazzarella Era in un lussuoso residence: oggi in Italia – Corriere del Mezzogiorno". Corriere della Sera. ^ "Quels sont les réseaux de la mafia en France?". 20 Minutes. ^ Cowell, Alan (May 14, 1993). "Italy Intensifies Crackdown on Organized Crime". The New York Times. ^ "La camorra à Paris : quand le boss roulait sa Lamborghini sur les Champs". AgoraVox. April 30, 2010. ^ "Greece". Il Fatto Quotidiano. ^ Redazione (February 24, 2018). "Invisibile e spietato, il boss da 1 miliardo di lire al giorno". ^ "Camorra, arrestato in Romania Gaetano Manzo, il "ragioniere" del clan – Sky TG24". tg24.sky.it. ^ "Le mani della camorra sul mercato del pesce: zero controlli sul pescato e rischi per i clienti". Napoli Fanpage. ^ "Caserta, ritorna in auge l'imprenditore faccendiere ANGELO GRILLO, sequestrati beni per 30 milioni di euro, beni immobili anche in Lussemburgo". ecodicaserta.it. ^ "Confiscato l'impero dell'imprenditore socio dei boss: ville, terreni e societa' sotto chiave". Noi. ^ "Polverino, il re dell'hashish – Napoli – Repubblica.it". Napoli – La Repubblica. ^ Redazione (March 14, 2018). "Il narcos arrivò alla piantagione di canapa sul monte a dorso di un mulo". ^ Yabiladi.com. "Morocco arrests an Italian national suspected of being leader of "Camorra"". en.yabiladi.com. ^ "Netherlands". Il Fatto Quotidiano. ^ "Cookies op AD.nl – AD.nl". Algemeen Dagblad. ^ News; Canada (January 20, 2017). "Stolen Van Gogh masterpieces found in Mafia's lair returning home after mobster's conviction – National Post". ^ "Maffiabaas en Van Gogh-koper werkte jarenlang in Amsterdam". Algemeen Dagblad. ^ Peru.com, Redacción (April 26, 2015). "Gerald Oropeza tendría nexos con capo de la "Camorra Napolitana"". Peru.com. ^ "Gerald Oropeza y sus vínculos con la temible mafia 'Camorra Napolitana'". América Noticias. ^ Redazione (August 11, 2017). ""Ragioniere" del clan Sacco-Bocchetti arrestato in Romania". Anteprima24.it. ^ Lazar, Valeriu (April 12, 2018). "Italian with businesses of millions of euros in Romania, arrested on charges of money laundering for the Camorra". ^ Farano, Adriano. "Roberto Saviano: Spain in mafia hands". Cafébabel (in Spanish). ^ "La Camorra en España – Revista Fiat Lux" (in Spanish). ^ Imparcial, El. "Camorra, España y Costa Nostra". El Imparcial (in Spanish). ^ "Spanish police strike blow to Camorra mafia crime network". thelocal.it. February 5, 2019. ^ País, Ediciones El (May 18, 2009). "Detenido en Marbella El Español, sanguinario jefe de la Camorra". El País (in Spanish). ^ "'Naples crime boss' held in Spain". BBC. February 28, 2005. ^ Chakraborty, Barnini (February 6, 2019). "Spanish police nab Camorra members after notorious crime family stole drugs from rival traffickers". Fox News Channel. ^ "La Svizzera e la mafia: un rapporto che dura da 50 anni". Ticinonline. June 21, 2018. ^ Limes, Redazione (March 11, 2000). "E LA CAMORRA SBARCÒ IN MONTENEGRO". ^ svizzera, RSI Radiotelevisione. "Camorra, i soldi verso Lugano". rsi. ^ "He insists he's just a normal businessman living quietly with his wife and children in Aberdeen. So why are Italian police so convinced Antonio la Torre is really a ruthless mafia don?". Sunday Herald. October 2, 2005. Archived from the original on March 15, 2006. ^ "Guns, extortion and death threats… the new claims facing Aberdeen mafia boss arrested in Italy". sundaypost.com. August 26, 2018. ^ a b Liddick, Don (2004). The Global Underworld: Transnational Crime and the United States. Greenwood. p. 34. ISBN 9780275980740. ^ Capeci, Jerry. The Complete Idiot's Guide to the Mafia. Dorling Kindersley. p. 5. ISBN 9781436293921. ^ a b Richards, James R. (1998). Transnational Criminal Organizations, Cybercrime, and Money Laundering. CRC Press. p. 7. ISBN 9781420048728. ^ "Organized Crime: Italian Organized Crime/Mafia". Federal Bureau of Investigation. Retrieved May 24, 2018. ^ Cohen, David. "Combating Transnational Organized Crime". United States Department of the Treasury. Retrieved June 26, 2012. ^ "Patto criminale tra 'ndrangheta e camorra Cocaina dal Sudamerica all'Europa – Corriere del Mezzogiorno". Corriere della Sera. ^ "Roma: sequestrati beni per 25mln alla "triade" di 'ndrangheta, camorra e Casamonica". CN24. ^ "Camorra e 'ndrangheta, 19 arresti a Roma". La Stampa. ^ "Così i superboss della mafia 'scelsero' Napoli – la Repubblica.it". Archivio – la Repubblica.it. ^ a b "Il procuratore capo della Repubblica di Napoli, Giovanni Colangelo nel mirino della Camorra e della Sacra Corona Unita? :: deliapress.it Bova Marina RC". deliapolis.it. ^ Ltd, Allied Newspapers. "Mafia boss extradited from Albania to Italy". The Times. Malta. ^ Internapoli, Redazione (August 30, 2017). ""La Puglia è roba di Marco Di Lauro". Per il pentito è 'o cavallar a gestire la droga con la Sacra Corona Unita". ^ Technologies, Advertis Web. "Los vínculos entre la mafia italiana y la colombiana tienen 50 años de historia – Internacionales". Los vínculos entre la mafia italiana y la colombiana tienen 50 años de historia - Internacionales - Elonce.com. ^ "Mafia Importer of Cocaine From Peru, Colombia Busted". Dialogo Americas. ^ "Storia di un clan e profilo del boss". January 21, 2010. ^ "Salvatore Iavarone catturato in Ecuador: è il broker internazionale della cocaina". .ilgazzettinovesuviano.com. April 27, 2016. ^ "Policía detiene en Ecuador a supuesto miembro de la mafia italiana". El Universo. April 27, 2016. ^ "La mafia italiana tenía sus tentáculos en Guayaquil". expreso.ec. April 28, 2016. ^ Caucaso, Osservatorio Balcani e. "Roberto Saviano on the mafia and Eastern Europe". Osservatorio Balcani e Caucaso. ^ "Scoperto il patto d acciaio tra camorra e mafia cinese". Il Giornale. ^ "Giro dirifiuti da prato a Honk Kong, il business di Camorra e Mafia cinese – Sky TG24". tg24.sky.it. ^ "Mafia nigeriana sempre più potente, nasce l'asse con Cosa Nostra e camorra". Affaritaliani.it. ^ Ltd, Allied Newspapers. "Italy, Austria smash mafia arms trafficking ring: officials". Times of Malta. ^ Heute, www heuta at. "Kärntner lieferten der Camorra Kalaschnikows". Heute.at. ^ "Kärntner Büchsenmacher sollen Waffen an die Camorra gefliefert haben". Die Presse. March 26, 2019. ^ "Camorra child gangsters replace omertà with social media boasting". The Guardian. February 25, 2019. ^ Tondo, Lorenzo (February 25, 2019). "Camorra child gangsters replace omertà with social media boasting". The Guardian. ^ "Napoli, come nascono e colpiscono le baby gang". panorama.it. January 17, 2018. ^ "How 12-year-old 'devils' are terrorising the streets of Naples". The Independent. October 12, 2018. ^ Postiglione, Fabio (September 20, 2016). "Misso: a Napoli baby boss manovrati dalle più potenti famiglie di camorra". Corriere della Sera. ^ Redazione (September 3, 2018). "E' morto Ciro Mazzarella, l'ultimo contrabbandiere di Santa Lucia". ^ "la Repubblica/cronaca: Camorra, arrestato l'assassino del giornalista Siani". la Repubblica. Retrieved March 28, 2016. Albanese, Jay S., Dilip K. Das & Arvind Verma (eds.) (2003). Organized Crime: World Perspectives. Prentice-Hall. ISBN 9780130481993. Behan, Tom (1996). The Camorra. Routledge. ISBN 978-1138006737. Jacquemet, Marco (1996). Credibility in Court: Communicative Practices in the Camorra Trials. Cambridge University Press. ISBN 0-521-55251-6. Richards James R. (1998). Transnational Criminal Organizations, Cybercrime, and Money Laundering: A Handbook for Law Enforcement Officers, Auditors, and Financial Investigators, Boca Raton (FL): CRC Press, 1998. ISBN 0-8493-2806-3. Mooney, John A. (1891). "The Two Sicilies and the Camorra". The American Catholic Quarterly Review. Vol. XVI, pp. 723–748. Train, Arthur (1911). "An American Lawyer at the Camorra Trial". McClure's Magazine,. Vol. XXXVIII, pp. 71–82. Wolffsohn, L. (1891). "Italian Secret Societies". The Contemporary Review. Vol. LIX, pp. 691–696. Wikimedia Commons has media related to Camorra. Wikisource has the text of the 1911 Encyclopædia Britannica article Camorra.